You patio door is one of the most visible parts of your exterior. That said, it could easily make or break your design. If your goal is to improve the curb appeal of your home, you need to select a patio door that can complement your architectural style. Choose a Style – A beautiful and high-performing patio door can transform the way you look at your living spaces. We know that every home is unique, so we make sure that we can meet your home’s particular requirements. You can choose from our traditional French style and contemporary doors. Our hinged and sliding French doors exude an old-fashioned feel, while our sliding contemporary doors in Las Vegas gives a more modern look. If you’re not sure what to pick for your home, you can always seek help from our trusted experts. 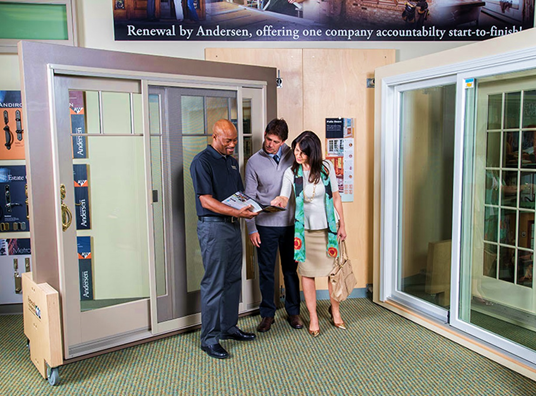 Choose a Color and Finish – We let our customers select the color and finish of their choice. We offer a series of elegant shades that can improve the look of any architecture. We have pine, oak, maple, and Prefinished White® for the interior finish, and canvas white, sandtone, and Terratone® for the exterior. Choose Your Hardware and Accessories – We provide a quality selection of hardware and accessories to let you pick your handle style. For our sliding and hinged French doors in Las Vegas, we have Yuma®, Tribeca®, and Covington™ among others. They are available in many long-lasting colors, such as white, stone, satin nickel, and bright brass. You can also pick from our exclusive selection of security options and grille patterns. Apart from being beautiful and functional, our doors are also energy-efficient. They come with High-Performance™ Low-E4® glass that you can upgrade depending on your home’s needs. With our doors, you can ensure a comfortable and efficient home for your family all year long. Schedule a FREE consultation today by calling us at (702) 722-2052 or completing our contact form.